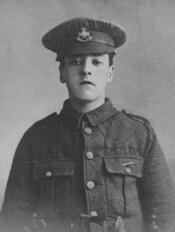 Young Frank attended the Church Street School and like his younger cousin he became an active member of Boys Brigade in Beeston and was the 16th Member of the Beeston Old Boys to die for his Country His cousin Percy was killed in Belgium in March 1916 - although their names are spelt differently in the Commonwealth War Grave Commission records. There is a record of Frank's younger brother joining the Boys Brigade on the 20th September 1913 at the age of 14, when he was working in Mr Hinton's milk business. The family had, by that time, moved to 15 Montague Street, Beeston. Private Pilmore joined the newly formed 15th Battalion Sherwood Foresters when they started recruiting in February 1915. The Bantam Battalions were the brainchild of Albert Bigland MP, Chairman of Birkenhead City Recruiting Committee, who suggested that all able bodied men of below the qualifying height of 5’ 3" should be formed into their own battalions. By mid February 1915 a unit to be known as the 15th (Service) Battalion Sherwood Foresters was formed in Nottingham by the Mayor and a committee as an all "Bantam" battalion and joined the 105th Brigade 35th Division which was part of the No 6 Recruiting District, In June 1915, the 15th Battalion found themselves at Masham in Yorkshire where they became part of the 105th Brigade 35th all bantam division. After training at various camps in England the Division was sent to France in January 1916. The following adjusted extract is from "The Blast of War"3: On the evening of the 19th July 1916 the Divisional Commander arrived at Brigade HQ, fresh from a Corps conference and ordered that the Brigade should capture some 1,000 yards of enemy trench from Maltz Horn Farm northwards, coordinated with a French attack. The task was allocated to the Foresters and appears to have been a desperately difficult venture from the outset. The frontage was far too wide for a battalion assault, observed artillery support could not be provided where it was needed most, and little time was given to troops that were already exhausted, hungry and under heavy artillery bombardment. Before the Attack Order was issued the officer commanding decided that only two companies were fit to attack, the other two being badly shaken by shelling and having been in gas masks for four hours under tear and chlorine gas shell fire. Two companies of 23rd Manchester’s were sent to support the attack. It was about this time that a corporal from the Sherwoods took his section of seven men out of the line, having had no rations for three days and being unable to stand up to the strain. This caused a panicky retreat from some of the men. The corporal was arrested. He was subsequently Court-Marshalled, found guilty of leaving his post, and was shot by a firing squad on 17th August 1916. Nevertheless the attack went on after dawn. Real limited success was briefly achieved. The total cost to the Sherwood's was heavy; ten officers killed nine wounded; thirty nine other ranks killed, 146 wounded and 36 missing, Private Pilmore was one of those wounded. Private Pilmore died in hospital in Rouen, and is buried in St.Sever Cemetery. During the 1914-18 war British camps and hospitals were placed on the southern outskirts of the city. The Hospitals at Rouen remained there for the whole of the war. They included eight General, five Stationary, one British Red Cross and one Native Labour Hospitals and No2 Convalescent Depot. A number of dead from these Hospitals were buried in other cemeteries, but the great majority were taken to St.Sever Cemetery, which is situated about 3 kilometres south of Rouen Cathedral. 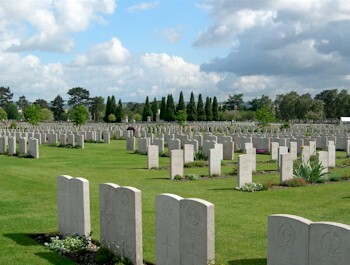 There are 3083 Commonwealth burials from the Great War. It was reported that Frank Pilmore's mother went out by sea to see her son; we have not been able to discover whether she got there before he died. 3The Blast of War: A history of Nottingham's Bantams. 15th Battalion Sherwood Foresters 1915-1919, by Maurice Bacon.